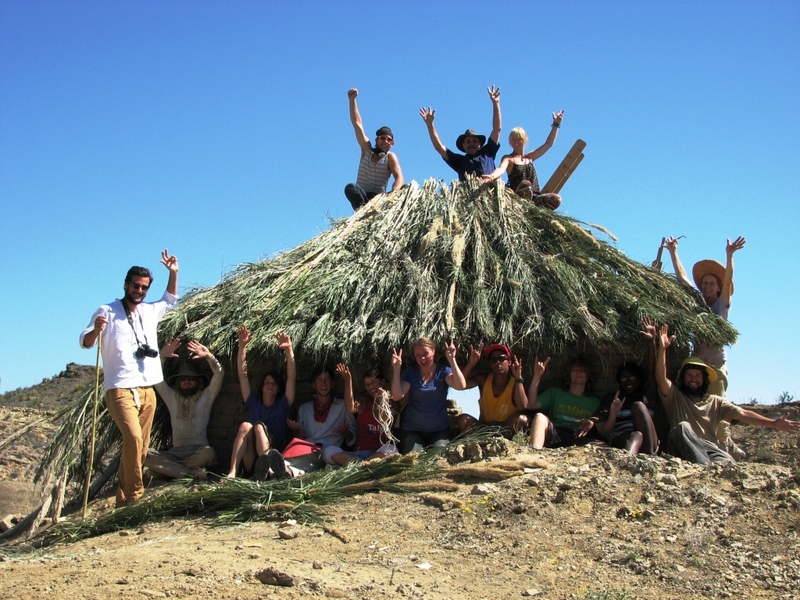 As a continuation of the Sustainable Living Program at Maharishi University of Management where students learn how to build a tiny house, a group of 12 students traveled to the Texas desert during their October Natural Building class and spent 11 days putting up a 14 x 14 adobe house made primarily from local materials. 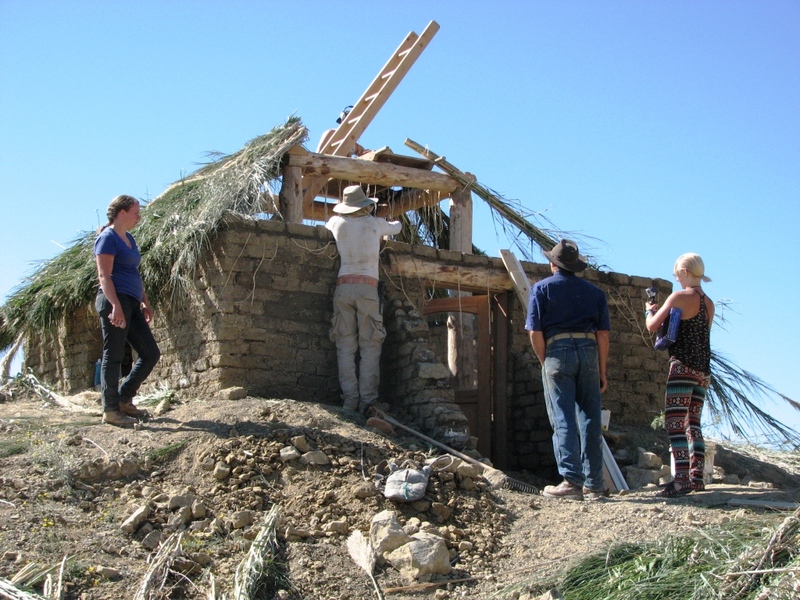 They first made 850 adobe bricks from soil near the construction site, created a frame of posts and beams from dead spruce trees harvested beforehand on campus, and then topped the structure with a waterproof thatched roof made of river cane. Intended to serve as a bunkhouse for future visitors, it sits on land owned by Mr. Stimson and his wife that’s adjacent to Big Bend National Park. Also on site is a tiny house students built last year. In addition to learning practical construction skills, the students had the opportunity to experience an extraordinary landscape that includes deep vertical canyons, distant mountains, and rock-outcroppings dating back 500 million years, fossils, petrified wood, and a hot spring on the Rio Grande River. Plus the occasional tarantula and scorpion. Mr. Stimson’s desert site is 80 miles from the nearest town on a road too rugged for ordinary cars. The students prepared and canned all their food in advance. That alone was a learning exercise in planning and execution. They traveled to the site via the Sustainable Living Department bus powered by biodiesel fuel that was made by the students and staff member Steve Fugate. Every aspect of the construction required learning new skills. The students began their work on campus, creating a plan and estimating the amount of materials they would need. Once on site, the students learned to sift the soil used for the bricks, moisten it with water, and then use forms to create the bricks. Once skilled, they were able to make a brick in less than a minute. But then the bricks, all 17,000 lbs. of them, had to be carried up a long hill. The students formed a chain, and accomplished the task with aplomb. He related an incident of the students trying to prepare and dry adobe bricks, when an early morning desert fog prevented the sun from drying them out. It happened three or four days in a row. Of the many things they planned for, he said, the desert wasn’t one of them! But the sun burned it off by noon each day, and the adobe blocks dried enough to be used. In order to comply with Maharishi Vedic℠ architecture, they learned how to perfectly align the building by using the North Star and the meridian transit off the sun. “It’s within a quarter or even one-eighth of a degree of being perfectly aligned,” Mr. Stimson said. He said his desert site is intended to serve as a retreat for campus groups and students in other departments, as well as the Sustainable Living students. Part of this report was taken from The Review, Vol. 29, #6, November 27, 2013. For more information visit http://link.mum.edu/AdobeHousePR. Read the description under this video posted on the MaharishiUniversity YouTube channel with more details describing how the students prepared for their trip, built their tools when they got there, gathered and processed the local materials to construct the adobe house. 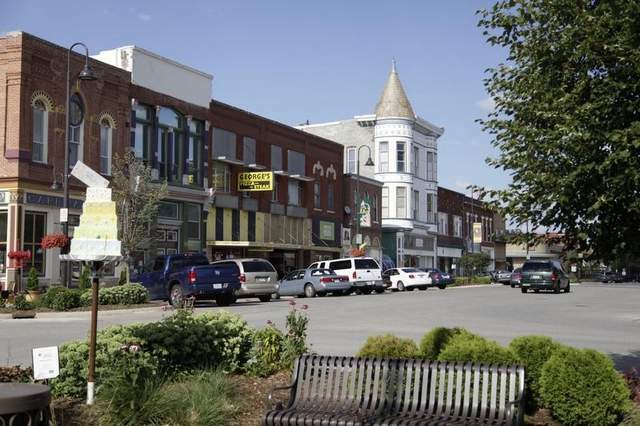 On the first Sunday in November 2013, the Des Moines Sunday Register published an Opinion piece about Fairfield, a city of around 10,000 in southeast Iowa. Written by editorial columnist Rox Laird, it praises Fairfield’s ability to work together as a community to manufacture dreams. Laird tours the town with Mayor Ed Malloy, who points out many cultural assets, creative entrepreneurial businesses, and green features for energy self-sufficiency, part of an overall plan for the city. They visit a new and unique net-zero classroom building housing the Sustainable Living Center on the campus of Maharishi University of Management in the north part of town. MUM obtained permission to make this wonderful article available as a reprint. Here is a PDF of the article: Fairfield defines community action, also available on the MUM website link.mum.edu/GreenFF. A photo of the Fairfield Arts and Convention Center replaces the Register file photo in the article. The same photos of the Sustainable Living Center and Mayor Malloy appear in the reprint along with FACC and MUM logos and contact information at the end. For additional information, I’ve listed some articles at the bottom related to some of the topics mentioned in the Op-Ed piece. Fairfield, Ia. – Drive around this Jefferson County seat with Mayor Ed Malloy and you begin to understand why this town is considered unique in Iowa. The obvious reason is the presence of Maharishi University of Management that is a magnet for Transcendental Meditation devotees from around the world, which is evident as Malloy wheels around the downtown square. It is lined with unusual shops, art galleries, bookstores, restaurants offering international fare, imported chocolates and teas. A monthly First Friday Art Walk draws a cross-section of the community and people from around the state. Just off the square, across from the Jefferson County Courthouse, sits the community center and the Stephen Sondheim Center for the Performing Arts. It is home to what is described as the only professional live musical theater company in the state and attracts a variety of performing arts events. A couple of blocks on is Malloy’s oil trading company, housed in an office building built according to the ancient Indian principles of Maharishi Vedic architecture that seeks harmony with the energy of the sun and nature for the well-being of occupants. Many examples of Vedic design can be seen in Fairfield and in Maharishi Vedic City, incorporated in recent years. Among the striking things about Fairfield is its ethic of self-sufficient sustainability. This manifests itself in many ways, such as a cooperative organic food market and a solar-powered radio station run by volunteers. Solar panels sprout from roofs and from freestanding structures. The city of Fairfield has an energy efficiency coordinator, whose salary is shared by the city and by Iowa State University’s extension service. In the city’s industrial park, Sky Factory uses backlit photography to create outdoor scenes for ceilings of hospitals and medical clinics. The plant has set aside space next to its parking lot for an array of solar panels and a garden tended by employees. On the opposite side of town, a mostly off-the-grid subdivision called Abundance EcoVillage captures energy from the wind and the sun, and draws air for heating and cooling from the Earth. This conservation ethic runs deeper in the community than these outward symbols of alternative and renewable energy sources. As a participant in Alliant Energy’s Hometown Rewards program, Fairfield took on a challenge beginning on Earth Day in 2012 to reduce its overall energy consumption by 4 percent. It hit that and exceeded it: Fairfield residents shaved electric and natural gas consumption by 8.5 percent and businesses cut theirs by 8 percent. Working with Alliant, which provided marketing and technical support, the city held workshops for residents and business owners, some 4,500 participants pledged to meet energy savings goals by doing laundry in cold water and installing compact fluorescent light bulbs. A fund was created to make loans for new windows and insulation. The total savings of 10.2 million kilowatt hours of gas and electricity is enough energy to power 1,077 homes for one year, according to Alliant, which independently verified the energy savings. Besides the savings on power bills, Alliant dangled a carrot in the form of a grant of nearly $19,000, which the city put toward installation of solar panels on the roof of the Fairfield Library this summer. Alliant Energy spokesman Justin Foss attributed the success of this impressive energy savings to the level of community engagement, working at a neighbor-to-neighbor level creating peer pressure that came from an active group that led the charge. Ed Malloy is perhaps the best example of how Fairfield has melded small town Iowa values with the exotic culture inspired by Maharishi Mahesh Yogi. Malloy is an immigrant from New York, practices TM and lives in a spacious and handsome home built to the exacting Vedic principles. He moves comfortably among traditional and nontraditional Fairfield, which is evident from his support by voters for more than a decade. Malloy says Fairfield’s can-do culture begins with setting ambitious goals, but achievements are celebrated by the entire community, not just the strong core of Transcendental Meditation followers fed by Maharishi University. Fairfield, Ia. – Maharishi University of Management here set out three years ago to build a new classroom building for its sustainable living program that lived up to the department’s mission. The finished product may be the greenest building in Iowa. The building is constructed of compressed-earthen blocks manufactured by students on site and load-bearing timbers consisting of full-size aspen tree trunks. It generates more energy than it consumes. It collects and treats rain­water from the roof for drinking and flushing. Daylight supplies two-thirds of light in classrooms and offices during the day. Passive and active solar energy is stored in 600 tons of earthen blocks and a 5,000-gallon water tank, which is supplemented with wind-generated electricity. It has a greenhouse for growing plants indoors and edible landscaping outdoors. The Schwartz-Guich Sustainable Living Center is performing exactly as intended. In fact, it is “exceeding our expectations in energy efficiency in cooling and heating seasons,” said Lawrence Gamble, professor of sustainable living at MUM and an irrepressible evangelist on the subject of renewable energy and natural resource conservation. Standing beside the center’s electric meter outside the building recently, Gamble pointed to the spinning wheel that measures electric consumption. The wheel was going backward, however, meaning the building was returning power to the electric grid. In fact, according to Gamble, the center produces about a third more energy than it consumes. And it consumes less than a quarter of what an ordinary building of the same size would consume. Besides employing nearly every imaginable green building technique, the Sustainable Living Center design follows the principles of Maharishi Vedic architecture, an ancient design philosophy from India that puts buildings in harmony with nature. It is hard to imagine a building that does a better job of meeting that goal. Terrific look around Fairfield by Rox Laird. It’s been fun over the last two decades or so watching Ed Malloy develop as one of the most effective and most congenial leaders in Iowa. The whole extended Fairfield community has been very well-served by him — and he has frequently contributed his talent and insight to state-level initiatives, too. Remember the fuss four decades ago when the Maharishis took over the old Parsons College? You’d thought the Soviets were coming in. I am disappointed that the Beach Boys never set up their planned recording studio there. Rox Laird did an outstanding job with the article and to have it recommended by my good friend Chuck Offenburger is icing on the cake. Thanks Chuck! Well-deserved praise. Fairfield continually strives to be a dynamic and creative community that embraces sustainable living. June 2016, Des Moines Register business writer Kevin Hardy wrote an article on Fairfield: Why this Midwest town is thriving when so many aren’t, which was also posted in USA TODAY. Maharishi University of Management professor Anil Maheshwari teaches a class on data mining at the school. The students learn how to glean insights from enormous data sets to help businesses serve their customers, among many other things. Maharishi University of Management is becoming a key player on the national stage for its research into data mining. Data mining refers to techniques for finding useful knowledge in a vast sea of information. Due to a recent partnership between IBM and MUM, university students have free access to IBM software to help them crunch huge data sets. They’re using those tools from IBM in a course titled “Business Intelligence and Data Mining,” taught by MUM professor Anil Maheshwari. The IBM Academic Initiative offers participating schools course materials, training and curriculum development to 6,000 universities and 30,000 faculty around the world. Maheshwari said modern computers have taken number crunching to new heights. They allow programmers to find correlations between sometimes seemingly unrelated variables. This kind of computing power is valuable for businesses because it allows them to fine-tune their advertisements. Businesses collect reams of information about the demographics of their customers. Data mining allows them to sort through this information to find out who buys the product, such as whether the customers are mostly male or female, young or old, single or married, etc. Learning which variables are important and which are not is key to a successful marketing campaign. Maheshwari said data mining holds the promise of being able to answer questions the way contestants do on a game show such as Jeopardy! He even mentioned a computer called “Watson” that has competed on the show. The computer is fed the question and then generates an answer based partly on how the words in the question correspond to encyclopedia articles in its database. Data mining power has reached a point where Watson’s sophisticated algorithms can arrive at the correct answer even when the question employs puns. A computer that can answer questions after searching through a database would be useful to doctors who are trying to predict whether a symptom in a patient is likely to lead to a malignant or benign tumor. Data mining computers could search through thousands of cases to find which variables, symptoms in this case, predicted malignant tumors and which predicted benign tumors. Such technology could be applied in other realms, too, such as finding out which students were likely to drop out of school based on data about previous drop outs. Maheshwari said collecting large amounts of data is easier than most people think considering so much of it is publically available on the Internet. 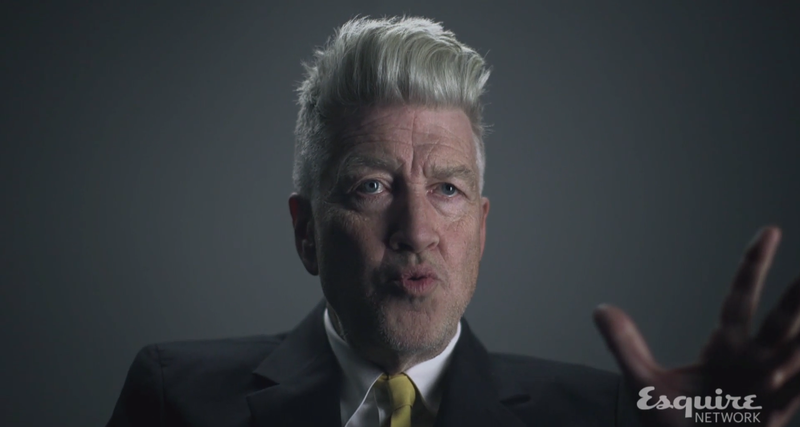 He said the government gathers massive amounts of data for everything under the sun. Accessing the data is not the tricky part – knowing how to separate the wheat from the chaff is. Actually, Maheshwari said the analogy he prefers is finding a needle in a haystack, because the vast majority of data in a database is useless in answering the researcher’s question. In response to the growing need for experts in information technology such as data mining, MUM has introduced an online graduate certificate program in Management Information Systems. The program can be completed entirely online in one to two years. This front-page news story is reprinted with permission from the Fairfield Ledger. Click on this link to see how it appears in that issue: FFLedger12-13-13_1A. For more on the story, including a video interview with Anil Maheshwari, see http://link.mum.edu/DataMining.